THIS COULD BE YOUR LAST CHANCE TO OWN A QUAD 50! ! If you missed out on the M2 HB semi-auto rifles, then don't put it off any longer! We have limited quantities of M3 Aircraft rifles remaining, and when they're gone, they're gone. Wow your pals with 4 M2 semi-auto machine guns on beautiful machinery! Comes with Trailer and mounting system. Take it with you anywhere! Call (714) 231-0330 for details and pricing! Trailer only - Firearms not included. 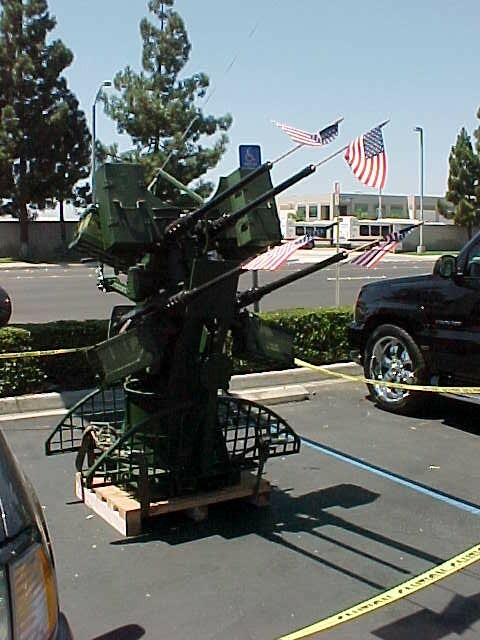 The M3 Ground Gun is comprised of an M3 Aircraft gun, newly manufactured M4 tripod, and shrouded heavy barrel. The M3 has a side plate that has been designed for a higher cyclic rate of firing. You will find the detailed workmanship and design of this remanufactured weapon to be very close to the original and is excellent for sharpshooters, re-enactors or military vehicle enthusiasts. Fires commercial ammunition or blanks. All components internal and external are finished with a gray military type parkerization process. See M2HB for images. The M2 helped gain air and ground superiority for U.S. And allied armies. They were used in fighters, bombers, tanks and front line infantry and saw action from WWII to present. The M3 appears quite similar to the M2 and will impress shooters and collectors alike. THIS IS YOUR LAST CHANCE TO OWN A LEGEND - A PIECE OF HISTORY - BUT WITHOUT ALL OF THE FULL AUTO HASSLES! ALL FIREARMS SOLD WITH A ONE YEAR PARTS AND WORKMANSHIP WARRANTY. CALL AND GET YOURS TODAY, WHILE YOU STILL CAN!! QUANTITIES ARE EXTREMELY LIMITED, PRICES SUBJECT TO CHANGE WITHOUT NOTICE. This Firearm Shoots Semi-Auto Only and Cannot Be Converted To Full Auto. This Firearm Is BATF Approved And May Be Owned In States Where 50 Caliber Rifles are Legal.